John Morrison Torrens: biographical notes. Known to his friends as Jack, this, his biography is initially given in the form of a list of (most of) the documents in my possession together with some extracts from Jack's diaries. This is the easiest way to form the skeleton of a person's biography and it can be fleshed out in time. The diary (or, rather, such extracts from it that I possess) are transcribed elsewhere as the John Morrison Torrens Diary Extracts. I have a number of photographs of JMT, and ones taken by JMT. Some of these are available in the photo gallery. As will become clear, my grandfather was a remarkable man. Pharmacist, chemist, dentist, microscopist, photographer, lecturer, lighting technician, violinist, organ builder, diarist, philanthropist, motorist and member of the Independent Order of Good Templars - he also acted as a father to his younger siblings after being left orphaned at age 18. In 1897, at age 20, he took possession of the chemist's shop in Youghal which he ran until the family was expelled from Ireland by the IRA in 1922. Initially the shop was at 102 North Main Street. Later he moved to 85 Main Street. Place of birth. According to his birth certificate, John Morrison Torrens was born at George Street, Sligo on 11th March 1877. A separate page details what is known of his father, Robert Jameson Torrens. JMT was apprenticed, for the sum of 50 pounds, to Richard Sunner of the Chemist's shop in Youghal to learn the profession of Pharmaceutical and Dispensing Chemist. The Indenture certificate is signed by JMT himself, his mother, Elizabeth Torrens, and by Richard Sunner. JMT was only 17. I have the Indenture document. It makes no mention of JMT's father, Robert Jameson. I hereby certify that John Morrison Torrens has faithfully served his apprenticeship to my full satisfaction. A Certificate from the Pharmaceutical Society of Ireland. JMT has passed the Preliminary examinations. It has been reported that JMT acted as a father to his younger siblings. A diary entry says 'Took possession of shop at 102 North Main Street'. Jno. M Torrens of Knockavenny, Youghal, Co. Cork was admitted as a member of Ireland Independent order of Good Templars. JMT Married Sarah Emma Devine in Youghal. JMT's father's profession was listed as 'Bank Officer' - which implies to me that the family did not yet know he was dead. Emma's father was George Devine 'Navy'. Witnesses george Devine and Lillie Devine (Elizabeth Emma World), Emma's mother. A diary entry says 'Removed to 85' - JMT's first shop was 102 N. Main St. 85 was a better location. £200 lent by JMT to pay off Mr Green's mortgage on old Post Office. Certificate to state that JMT is the proprietor of 3 shares of £1 each in The Youghal and Blackwater Tourist Steamer Company Ltd.
A framed certificated declares that John Morrison Torrens has been made a Freeman of Youghal by reason of Birthright. 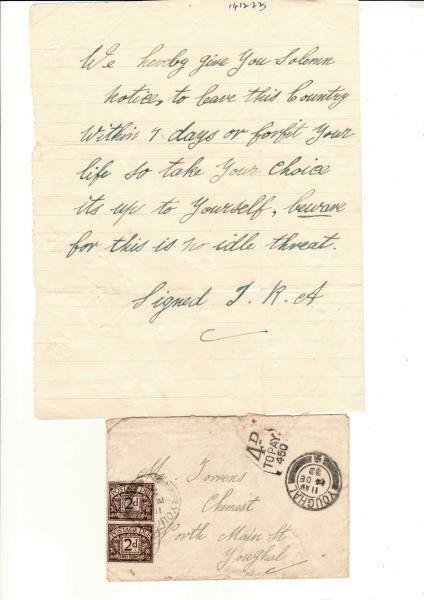 A letter, signed J J Carroll, Capt from Co. Inspector's office thanked JMT for kindness to wounded officers on two recent occasions, on behalf of the Royal Irish Constabulary. Owner's Permit for Motor Vehicle, type New Hudson Cy 2½, Reg No WI 75. To add insult to this - JMT had to pay excess postage on the letter. Driving permit no 300. JMT Age 46, Height 5-7½, Build: Slight, Hair: Light. A photograph is attached. Owner's Permit for Motor Vehicle. Type: Humber. Regd. No IF 527. A letter from Freemasons: regrets JMT's decision to leave Ireland and go to Bournemouth. Agreement between Harold Maurice Soffe and JMT (of Glenthorne, Dudsbury Avenue, Ferndown, Dorset), Dentist, re lease of Glendower, Victoria Rd, Ferndown. Cause of death given as 'Shock, multiple injuries and burns as a result of a collision between motor cars.' The accident occurred at Cadnam in the New Forest and there are some photographs of the vehicle in the papers. Em died at Royal South Hants and Southampton Hospital. More details are Sarah Emma (Divine) Torrens notes. 11th November 1943 Richard John Torrens (author of this www site, and grandson to John Morrison Torrens) was born. On Sunday 20th February 1944, we picked JMT up at Ferndown Crossroads and took him to Hampreston for the Christening of his grandson Richard John. After the ceremony we all returned to 85 Wimborne Road. About 5.30 JMT and I left to see a dental case of particular interest. On the way, he complained of the cold and a tight feeling in his chest, and said that he was feeling tired. After traversing the long corridor of the Hospital he complained of shortness of breath, and had to sit down on the way out. Leaving him at his house, I suggested that he should see his doctor on the morrow, and he returned home. On Monday he saw a number of patients and appeared quite fit, although he remarked to one of them that he was feeling tired and would like a holiday, but there was no indication that anything was wrong. On Tuesday morning at 4.30 a.m. Dr Courtin phoned me from Glendower, and informed me that JMT had called his housekeeper and giving her the phone number, had asked her to call him. He arrived there about 4.15 and father passed away a short while afterwards. That day, of course, I had very little time for anything except seeing people and arranging necessary details.